Thanks to the rummest of chums, Sharla, for introducing me to this one. I find it adorable, though by singing it I do not mean to imply that I approve of the main characters' behavior. Shocking, simply shocking. "Arrah, jewel," said he, "are ye sleeping or waking? Katie, mo mhuirnin, you must let me in." "How can ye be taking me out of my bed? It's whiskey, not love, that's got into your head." What has a poor girl but her name to defend her? No, Barney, mo mhuirnin, I won't let you in." That weeps for the wrong I might lay at your door! Barney would die to preserve it as pure!" 'No, Barney, mo mhuirnin, I won't let you in.'" *Alternate titles: "Barney and Katty", "Barney and Katy", "Katty Avourneen", "Katy Avourneen", "Katie Avourneen", or "When Barney Flew Over the Hills". Harp and voice. Sweet as hell. Banner photo by Steve Giovanis. 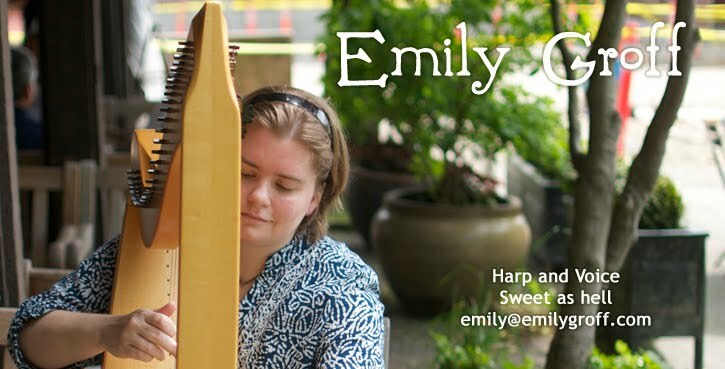 Site created and maintained by Emily Groff. Picture Window theme. Theme images by Airyelf. Powered by Blogger.